Hallo! Guten Morgen! - live. travel. blog. Wie geht’s dir? Was gibt’s Neues? How are you? What’s new? Where in the world is Lynda? Well, at the moment I am in Munich, Germany. This blog will be short and sweet because we are not here for too long. On the way into Munich yesterday we stopped in at Dachau Concentration Camp. 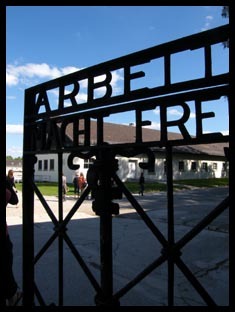 Dachau was a Nazi German concentration camp, and the first opened in Germany, located on the grounds of an abandoned munitions factory near the medieval town of Dachau. We had free time to explore the camp site which was rather spooky and chilling. I could just picture what was happening there so many years back when the Jews were being held captive against their will. The most creepiest of experiences was walking into the room that housed the kilns they used to burn the Jews in. Curse my vivid imagination, because at that moment, such horrible images ran through my head. I could almost hear the cries and screams of the helpless children and mothers behind that wall, oblivious to what was about to happen to them. Bless their souls. Just before dinner we stopped to view the Glockenspiel. We were not there at the right time to experience it go off, but apparently it is an extraordinary sight. We were off to the Beer Hall for dinner. I was looking extremely forward to this. The beer glasses in Germany are massive mug-like cups. The German ladies can carry up to ten of these mugs at the one time. They are not light, either, I struggled to lift my own mug, let alone ten. I have no idea how they did it. It was an amazing sight. They bring them to the table then let them go, and due to the weight of the mugs, they make a big bang onto the table top. 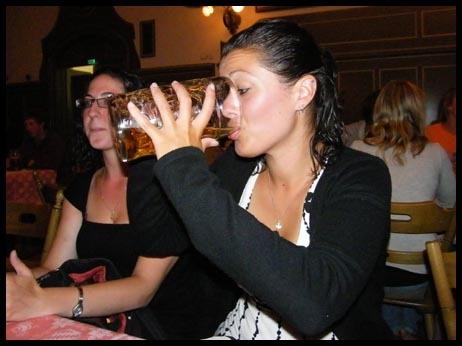 I am not a big beer fan, however, I forced myself to down the entire beer, just to say that I did it! Dinner was absolutely delicious. Pork knuckle. Yum. The crackling was to-die-for and the pork itself tasted scrumptious. Again, mum, I am sorry, but my God it was slightly better than yours… sorry, do not hurt me, I repeat, do not hurt me. Every few minutes in between dinner, this German man would jump onto the microphone and sing this song in German and we would all have to scream “PROBST” (Cheers in German) and smash our beer mugs together. Too much fun.